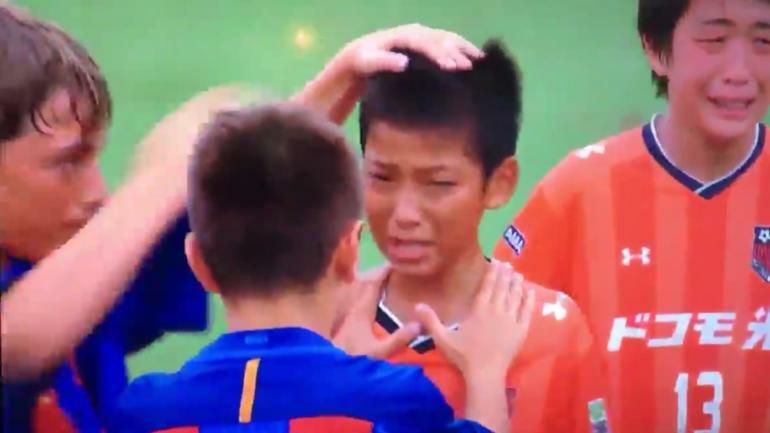 At a 12 and under tournament, Barcelona beat Japan 1-0 in the finals of the Junior World Cup. After the final whistle, members of the Japan team were openly weeping. It crushed them to lose. Members of the Barcelona team noticed their reaction and stopped celebrating. They immediately began consoling the team they just beat. Joe’s Perspective: Sport really does teach so much. These 12-year-old kids just taught us all a lesson in sportsmanship and humility. Even with language barriers, you could tell the Barcelona kids were saying, “Keep your chin up,” “Don’t get down on yourself,” and “you were amazing.” I wish all competitors could be so gracious. Your Turn: On a scale of 1-10, how much sportsmanship do you display after a big win? Explain. On a sportsman scale of 1-10 I believe I would show a 4. I gave myself a 5 because after a big win I’ll be more concerned about celebrating and being with my teammates instead of comforting the other team. This is a beautiful story. I wish everyone would show such sportsmanship as these 12-year-olds did. Sometimes I find myself struggle with good sportsmanship if I beat one of my family members at something usually I rub it in their face. I do this because I mess around with them all the time, but I should try to be nicer about winning. With strangers I have better sportsmanship because I don’t know them or if they’ll get upset, but I think I should try to work on my sportsmanship with everyone I know. This is a great passage. Show how sports can teach you more than the sport itself but teach you a lesson in life. Teaches you sportsmanship meaning working with others you can use that in a workplace you have to be able to cooperate with others. Even when your losing you should still show sportsmanship and encourage your team to get back into the game. 10 I always shake peoples hands and tell them great game man, u played good. Of course I celebrate but not a lot I just smile and keep going. The amount of sportsmanship I display depends on the game I am playing. For example if it’s the state championship and my team wins I will not console the other team because I will be celebrating, so it would be a 1. If its a normal game and someone’s down I will show sportsmanship because there wont be big celebrations or anything big. This shows how we gain a sense of pride when we get older, i guess they haven’t learned to have that sense of pride yet. 8 cause when I’m in the moment after a big win or against a really good team I celebrate because we were basically the underdogs I’m the game and it was a upset after. I apply some sportsmanship by i will tell the other team good game or shack there hands. Added to my paragraph: On a scale of 1-10, I say a 6 because this was all the hard work we put in to practice to get this big win and it happened. 9. If things go bad and someone needs my help and my support I will always be there for them no matter what they are going through. I will always put what is happening in my life on pause if someone needs my help. 10 its very important because you should never put no one down. Always tell them they played good. I give it a 10 because both team tried their best but other team came out on top. You still have to congratulate both teams and tell good game and then just keeping moving because at the end of the day you gave it your all . I would say a 10 because after a win or a loss I always go to the other team and shake there hand and say good game and you played great, and I even sometimes go to the opposing coach to tell him that he did great on coaching the team in a win or even a loss. In everyday life If something bad happens I think I display good sportsmanship in a way because I am very comforting to other people and let them know that everything is going to be okay and work out in the end. 10, when I played baseball no matter the score or the win my coach, coach Koosa, taught us nothing but sportsmanship when winning or loosing. We still would celebrate and he would boost confidence on us individually and as a team telling us what we did do good and bad. But being a jerk after a win was not an option, which taught us the bigger picture. We shook hands with every player and coach and umpire after the game no matter the score, outcome, or what happened. Because the game was over and it is in the past. Are objective was to focus on the upcoming game and focus on our mistakes in practice. And it paid off. I am probably a 4 when I win things. I try to be consoling and a humble winner but often I find that it’s hard to be like that when you’ve just won. Outside people rarely show good sportsmanship and so I think that society, and by effect, me, hardly show any in return. On the one hand, I’d like to be able to say I’m a good sportsman when I win but in all honesty, I’m probably not and probably won’t be most of the time. It’s a shame but that’s how we have come. I am a big Clemson fan and I think that Dabo Swinney, in my biased opinion, is one of the better people who show good sportsmanship and I would like to be more like him. I think I display good sportsmanship in a way because if something bad happens in life I am very comforting to other people and let them know that everything will be okay and work out in the end. Probably a 7 because if I win I don’t rub it in peoples faces but I don’t try to cheer the other team up. If I lose I congratulate the other team. 8, most of the time if I see something wrong with someone where it touched them at heart I try my best to show I care. I would want the other team to see how we would handle the situation and later down the road if they won show the same to the other team. Probably an 9, I do a lot of sportsmanship during games and shake peoples hands, but I dont always do as much as I can. 8 When you win a big game or achieve a goal that you have been working towards its easy to just flat out celebrate and never congratulate the other team for their accomplishments as well because you are so excited that you finally did it. When you do congratulate them you have to be humble and caring and that part is definitely the hard part of winning. I most likely show an 8. I show good sportsmanship, but I also would be proud that i won. I would give them a handshake and say good game or good job. 8. I base my sportsmanship on how sportsmanlike my opponent is. If its a good team, and respectful players, then I strive to show just as much respect to them, but if it is a team that has talked trash and been disrespectful, then I tend to let my competitive side show, and put anyone that disrespected me, in their place. I would say my sportsmanship on a level of 1-10 is probably a 8. After every game of softball we always shake hands but if we weren’t always made to do it I probably wouldn’t do it every time. 8. I always shake their hands after the game and I’m always respectful. I don’t usually go out of my way to console the other team though. Like a 8. I always shake hands and tell the other team good game. I just do the basic sportsmanship. 8 When my team wins a game I am very proud of them, I don’t really pay attention to the other team. But I make sure to be a good sport. I think that I range between a 6-7. I try to be as humble as possible but sometimes the other team gets so mad and they don’t want to hear it so I just have to fall back. I would give myself a 6. I am not rude or unsportsmanlike at all. But I also am not very concerned if they are upset. Everyone is sad about losing, that’s the way of the game.